In the past few days we have seen references to the ongoing testing of Windows Phone 8 OS in a leaked Nokia advertising poster and then the browsers of the OS appeared in Hitlinks’ browser details. 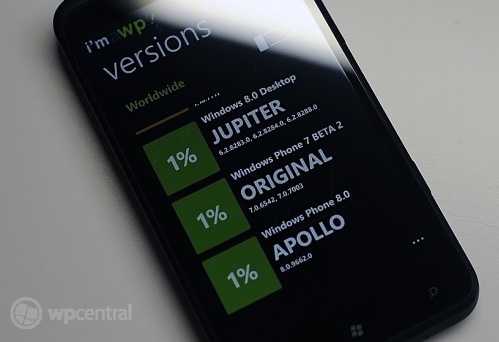 Today thanks to the app “I’m a WP7” we are getting to know that Microsoft is indeed testing the OS internally. Someone who is testing the OS somewhere underground was too kind (or dumb) enough to install the I’m a WP7 app over the device which has now gone on to record the version Windows Phone 8 “Apollo” build 8.0.9662.0 in the device statistics sections. So again this interesting leak from stats goes on to confirm that the Windows Phone 8 will be called the Windows Phone 8 on arrival and is currently code-named ‘Apollo’ as we have been hearing since ever. The WP8 is said to unveiled this summer and arrive in Q4, 2012 and bring in features like dual-core processor support, higher display resolutions, NFC and much more.